Authentic cabaret texts are hard to come by. This material was written for the day, not for posterity, and was seldom published. Much manuscript material has been lost in the wake of war, persecution, and exile, and many of the authors who were mainstays of the Kleinkunst stage in the twenties, thirties, and forties are forgotten today. 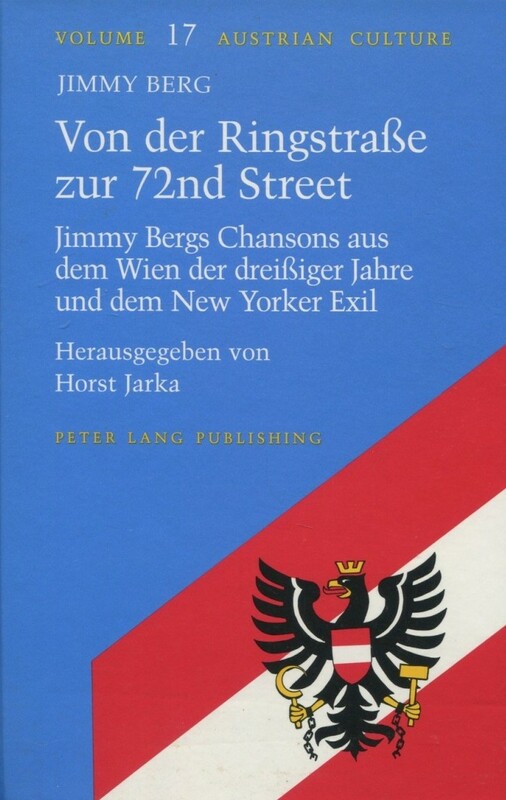 This broad collection of some eighty song texts by the little-known Jimmy Berg, spanning from Vienna just before the “Anschluss” to America during his exile and the years just following the war, makes a considerable contribution to our appreciation of an art form on the margins: one that from its ironic outsider position was able to probe and diagnose its time and its audience in a most provocative fashion. Jimmy Berg (1909-1988) was a symbol and a spokesman for a generation. As we read these songs, a hidden world opens up, the experiences of an uprooted middle-class adrift between cultures and languages. Through their sharp-witted monologues, we meet a parade of characters including Sophie the market woman, the Aufbau reader recalling his Viennese cafe, the Hollywood extra dreaming of Stardom, the “friendliest enemy alien in town,” a new citizen lamenting his rejection by the draft board, and countless other “little people” who grow into icons of their times. All these figures are torn between their struggle for assimilation and their insistence on their identity as Viennese Jews. Often nostalgic and hopelessly perplexed, they are never lachrymose; a brash tongue and relentless optimism see them through the worst of times. On the cabaret stage, these texts helped their listeners come to terms with their own vulnerability and hold on to their dreams for a better life. There are no literary pretensions to these songs, but their intimacy and light touch as well as their surprising humor and rhymes make them exemplary samples of the genre. Berg’s texts range from Schlager and operetta parodies to spoofs of cultural detritus (cafeterias, cigarettes, dime stores, newspapers, or film stars), but also include satires of the Nazis and laments on the hardship of migrant life. The latter theme pervades the bulk of his songs written for New York’s German cabaret “Die Arche,” and Berg’s struggles with the new lifestyle and the new language make for some of his most characteristic pieces, written in a riotous mixture of German and English. 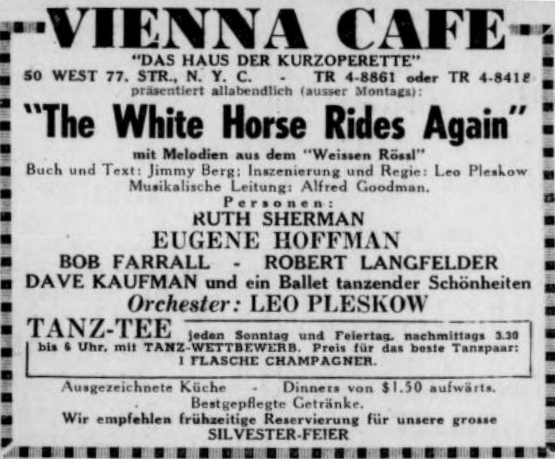 Advertisment for “White Horse Inn” from “Aufbau,” December 1947. 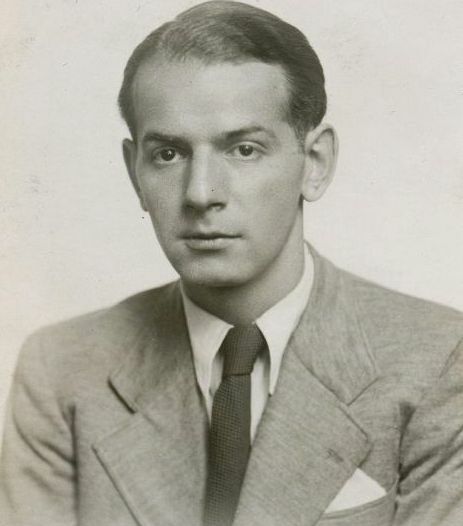 Through these lyrics, we follow Berg’s changing relationship to his home city of Vienna, as melancholy nostalgia changes to a bitter postwar rejection of the old world and its lingering anti-Semitism, and Berg ultimately celebrates his new identity as an American. Despite their playful irony and occasionally formulaic style, the songs have an unusually personal tone that gives them a rare authenticity and immediacy. Footnotes for both German and English-speaking readers explain many now obscure topical references, and numerous illustrations plus a lively biographical introduction greatly enrich the collection. One only wishes for more precise dating of individual texts, as well as detailed information on performance locales and singers. Cabaret songs, however, are not meant to be read – they are created to be performed and heard. Jarka makes up for this limitation as far as possible by giving us the music to ten of the songs and a supplemental cassette, available directly from the editor, featuring Jimmy and Trude Berg. Here the texts truly come to life. We should be grateful that these lyrics and their stories have been saved.